This issue’s cover features Ally Kennen and her latest book, Quarry. Ally Kennen is interviewed by Julia Eccleshare. Thanks to Marion Lloyd Books for their help with this January cover. Cactus Annie’s first day at Cowgirl school couldn’t have been much worse and her teacher tells her she will need to start believing in herself if things are going to get any better. When Annie learns that there will be no more school because the rat rustlers have stolen all the cattle, she is secretly delighted and skips happily home. But wouldn’t you just know it, on her way home she discovers the stolen cattle and has to test all her cowgirl bravery and courage to save the day and defeat those pesky rat rustlers. This is a lively, funny picture book which deals in a very light-hearted way with starting school and believing in yourself. 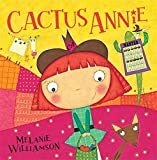 The story reads aloud well, with plenty of ‘Yee-haa’s’ for joining in with and the illustrations create great characters and some splendid inventions. All in all a fun book that will be much enjoyed by a wide age range.